Walmart is America's largest non-government employer, with roughly 1.5 million workers at its 6,363 stores around the country, according to a new report. 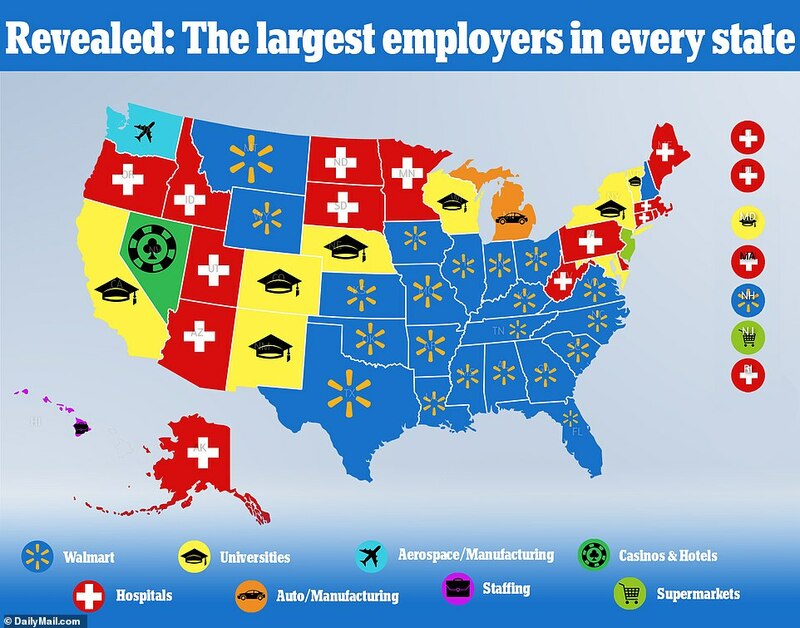 A new analysis by 24/7 Wall St compares the largest non-governmental employers in each state, finding that Walmart comes out on top in 22 states – dominating in the South, Midwest and the Rust Belt. While state governments tend to be the largest employers in much of the country – with more than 5 million state employees nationwide – the latest report breaks out the largest non-governmental employers to find that universities (seven states) and hospital systems (15 states) also dominate the workforce in many states. The size of the employers varies significantly around the country. For example, Alaska's largest employer is the Providence Health & Services network of hospitals, which employs about 4,000 people. By comparison, Boeing employs nearly 80,000 people in Washington state. A few states – including Washington – were outliers, meaning they were the only ones with a specific industry counted as a top employer. Those include: Nevada (MGM Resorts International is a casino and hotel employing 51,000 people); New Jersey's Wakefern Food Corporation was the only supermarket on the list (40,000 employees); Michigan (General Motors is top in that state with 52,113 workers) and Hawaii (Altres Industrial is the sole staffing agency on the list with 10,000 employees). Amazon, the nation's second-largest employer with 400,000 U.S. workers, did not come out on top in any states. Walmart employed the most workers in Texas, where 164,611 of the company's employees reside, followed by Florida (105,888 workers). However the single biggest employer on the list was the University of California, a public college with 227,786 workers. Universities also were the leading employers in Wisconsin (39,000), Vermont (7,500), New York (91,182), New Mexico (27,000), Nebraska (14,000) and Colorado (36,000). 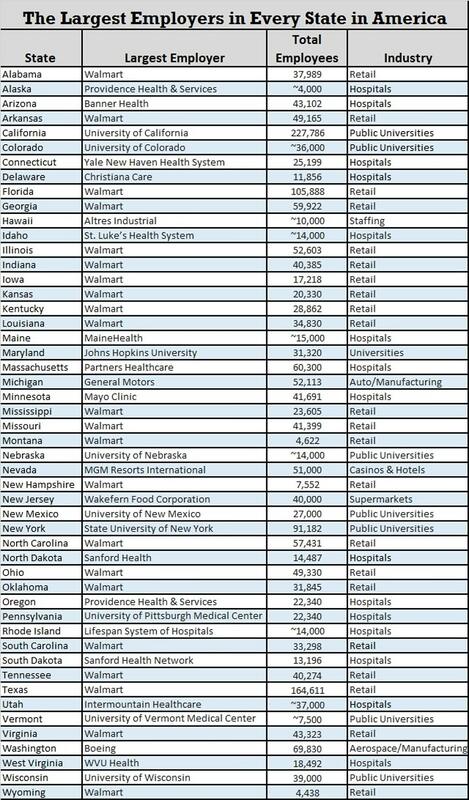 The biggest hospital system on the list was Partners Healthcare in Massachusetts, which employs 60,300 people. Researchers used employment data from nonprofits and private and publicly held companies and excluded military bases from the list.